I tried out a new circular needle recently and it was a game-changer. 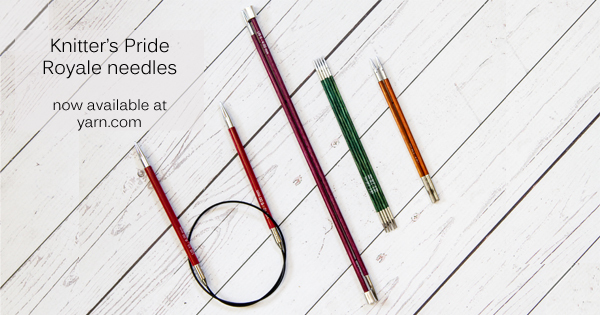 Knitter’s Pride Royale fixed circular needles are wood with metal tips, which I like (somehow, metal seems pointier). What I really love about the Royales are that they SWIVEL at the join. Come on! Yes, they do. No kinking up, no twisted joins, just smooth sailing. This swivel is only available in the fixed circular needles, not in the interchangeable sets, alas. But what a great reason to stock up on sizes you may need for your holiday knitting! They’d be a great stocking stuffer for a knitting group buddy, or an in-law at a gift exchange. I’ve been making some deadline projects lately, but once I free up my time and buy the right size Royale, I’ll be casting on the Genevieve Baby Cardigan for a special baby arriving in December. So fast, so delightful on the right needles. Check them out!